This is not a drill: "J.R. Smith for President" T-shirts are now on sale. During the Cavaliers&apos; victory parade, where Clevelanders celebrated their first NBA title in franchise history, someone got this sign in the hands of Smith. It may have started off as a joke, but on Thursday, Smith showed up at the Bridgestone Invitational and wait, what shirt is that?! Many people were wondering the same thing, as well as where they can cop their own. @TheRealJRSmith need this shirt JR.
@TheRealJRSmith where can I get one of those shirts?! @TheRealJRSmith @WGC_Bridgestone I need that shirt, take my . Earlier today, Smith blessed us with the info on where we can buy our own United States of Swish shirt. Smith partnered with Fresh Brewed Tees on the limited-edition item. If Smith is going to wear a shirt, this is as good as it gets. Well, maybe it&apos;s a close second. 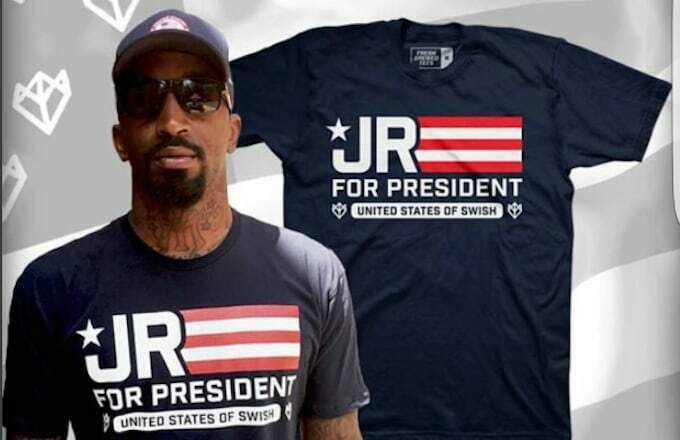 You can pick up your own "JR Smith for President" tee here.